We’d love your help. Let us know what’s wrong with this preview of Dark Winter by A.J. Tata. By the time anyone realizes what’s happening, it is too late. A dark network of hackers has infiltrated the computers of the U.S. mi In a blistering scenario almost too close to the headlines, former Brigadier General Anthony J. Tata delivers a chillingly authentic glimpse of tomorrow’s wars—and the anonymous hackers who hold the fate of the world at their fingertips . . .
To ask other readers questions about Dark Winter, please sign up. After the events of Direct Fire (2017), Jake is vacationing on a North Carolina island with his girlfriend, Cassie Bagwell, when the crap first hits the fan. The two are laying low, enjoying some much needed and well-earned R&R when they’re pulled back in and told of the mayhem erupting around the world. No When a sinister plot to start the next world war kicks off, it’s up to former Delta Force operator Jake Mahegan to save the day in the latest heart-thumping thriller from Anthony J. Tata. Punching the clock and rolling up their sleeves, Jake and Cassie get to work and quickly uncover that a group of . . .
What a fascinating and exciting read! First, thank you to NetGalley for the chance to read this book in exchange for an honest review. Brigadier General A.J. Tata has written an amazing book. Coming off of the thrilling novel Direct Fire, the fourth installment in the series, Tata has returned with Jake Mahegan for a riveting look at the current state of our country. After a vacation with his girlfriend is cut short, Mahegan immediately dives right back into action. This time, Tata has created a p What a fascinating and exciting read! After a vacation with his girlfriend is cut short, Mahegan immediately dives right back into action. This time, Tata has created a plot that has one of the most realistic plots I have read in quite some time. With Mahegan trying to stop an electromagnetic event, meaning the internet stops and the lights go out, he stops at nothing to protect America. As a someone who works in tech, I was especially excited to read this book once I heard that it had a tech-bend to it. Tata definitely did his research with this novel. He combines the enigma of the dark web with real-life, potential scenarios to derive an intense, interesting, and amazingly timely story. I thought the way Tata described what could come from an electromagnetic event was spot on, and he was able to intertwine technical jargon in a way that makes sense to the reader. This book was not only extremely interesting, but as I said, it is amazingly timely. It is the most real-world scenario that I have read, which made the book all the more frightening and thrilling. The characters actions are right on. Mahegan stays on track saves the US from an armageden attack that only he can do. A great thriller about Cyberwarfare . Another superb read. Thanks Tony, what is next. Looking forward to more of your stories. Will discuss this with our golf group today. Read the Headlines? Then you Need to Read This Book! Best book ever from a great writer. Well done General. A very timely techno-thriller. The main bad guy is a Mark Zuckerberg, Jeff Bezos, Alphabet Corp mashup. Intriguing and difficult to put down. AJ Tata does it again. Great read again! Can't wait for the next in series. Ian Gorman has parlayed himself into an Uber rich businessman in the world of retail and technology, bigger and richer than google, amazon etc combined. This is one of the monsters in a j Tatas newest book starring jake mahegan. There are plenty of other monsters including the Syrians, the Russians and the Koreans. All put together in one of the scariest plots I have ever read where the worlds computers are controlled by one man and a brilliant team of code writers, hackers and artificial intell Ian Gorman has parlayed himself into an Uber rich businessman in the world of retail and technology, bigger and richer than google, amazon etc combined. This is one of the monsters in a j Tatas newest book starring jake mahegan. There are plenty of other monsters including the Syrians, the Russians and the Koreans. All put together in one of the scariest plots I have ever read where the worlds computers are controlled by one man and a brilliant team of code writers, hackers and artificial intelligence. Of course good u s of a wins but barely and with seconds to spare. As I read this book and the plot unfolded I could not help think of trump with his self professed brains (?) and millions available to him. Nah, it would never happen with him. World War III waged by the computers but stopped by the Captain and his crew. Not an original storyline but the writing and narrator (audiobook) made it believable. Fair premise based on today headlines and fears connected to nukes and technology, the internet and an evil mine. A little slow on the build up but the second half of the book was enjoyable. This book was phenomenal. For Jake Mahegan and his group of highly trained operatives, the stakes couldn't be higher. A maniacal, narcissistic genius'; with global influence, creates an unbelievable plot to destroy the world as we know it and recreate it with himself. He has the perfect leverage to manipulate the worlds superpowers and create chaos. The writing was brilliant from beginning to end. Great villains with quirky motivations, personalities that seemed all to real. 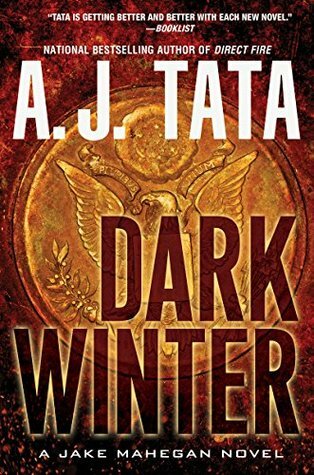 "Dark Winter" eBook was published in 2018 and was written by Anthony J. Tata (https://www.ajtata.com). Mr. Tata has published nine novels. This is the fifth in his "Jake Mahegan Thriller" series. I received an ARC of this novel through https://www.netgalley.com in return for a fair and honest review. I categorize this novel as mostly ‘PG’ because it contains scenes of Violence. The story is set in the contemporary US, Russia, North Korea, and Iran. Foreign-based hackers penetrate the US military "Dark Winter" eBook was published in 2018 and was written by Anthony J. Tata (https://www.ajtata.com). Mr. Tata has published nine novels. This is the fifth in his "Jake Mahegan Thriller" series. Foreign-based hackers penetrate the US military and cause havoc with the various weapons systems. Nothing works as it should leaving the US defenseless. The US power grid is disrupted plunging many into darkness. Russians invade Europe. Iran invades Iraq. North Korea attacks the south and Japan. A new form of warfare, ComWar, is underway. The only way to stop the ComWar is to destroy the control centers. But that won't be easy with them located in Russia, Iran, and North Korea. Mahegan's trained team must split up and take on all the control centers at the same time. If the control of ComWar cannot be disrupted, the world is headed for World War III. I thought the 8+ hours spent reading this 464-page thriller was interesting. Interesting take on technology. While I have read the previous two novels in this series and liked them, I did not think this one was as good. This novel reads well on its own even with the prior novels in the series. I give this novel a 3.4 (rounded down to a 3) out of 5. I have to admit that I was/am a bit disappointed in the entire story/premise of A.J.Tata's latest Jake Mahegan novel. I don't know why, but the book seemed to be "grasping" for definition the entire time I was trudging through it. I have enjoyed the prior stories, possibly because they didn't reach so far and so wide as to make Jake into a super-hero. Sorry, this one just didn't keep me as interested. I'm hoping the next novel is a tick upward, as the past novels were. I had a little bit of trouble getting into this book but enjoyed it once the story started moving along. Scary how easily something like this could actually happen. I'd read other works by this author. Think I might have enjoyed it more had I started at the beginning of the series with the main character. This book is nonstop action with a great plot as an added bonus. Recommended to anyone who likes nonstop action. I have enjoyed all the books in this series. I just couldn’t get into this one for some reason. Too much military jargon for me. this book was just bad. to complicated. in great depth on things that were confusing and did not matter. adding the romance piece weakened the story. this may be the end of me reading this series.